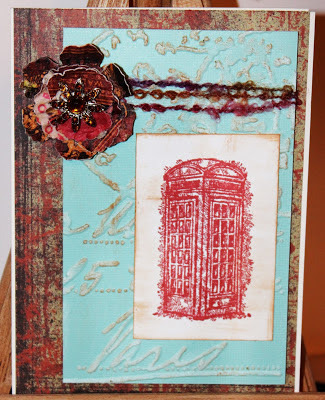 The featured stamp set today is Stampin' Up! 's 'Feeling Sentimental,' and it encapsulates the way I feel about this card, which I made for my friend Germaine. I made this card, with a few extra samples, to wish Germaine a Happy Birthday tomorrow on February 23. 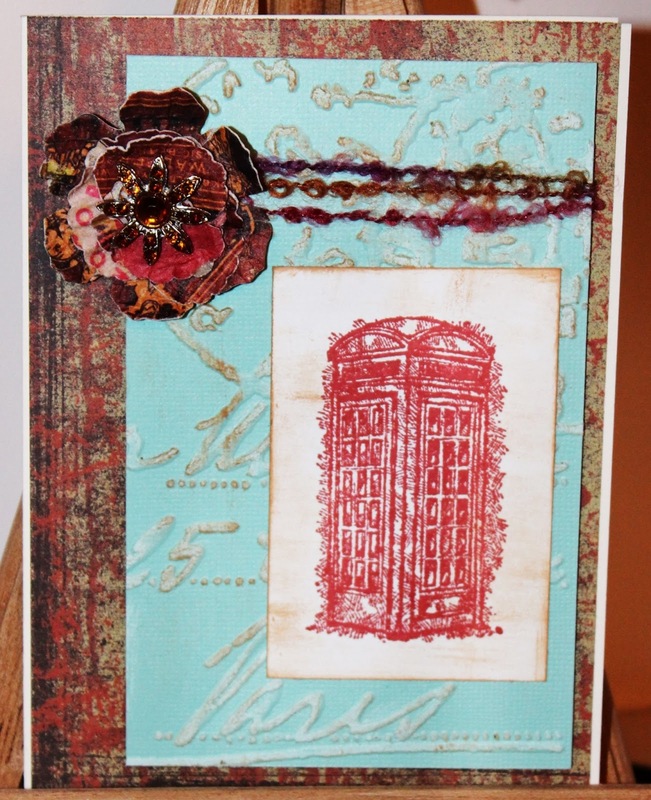 In addition, I wanted the card to be a farewell card from England, and the red phone box was the perfect image. Some of you in the stamping world might know Germaine. She's been actively involved in Stampin' Up! since living in Houston more than a decade ago. We have followed each other around the world, it seems; we first 'met' on a stamping e-group back in 2003. This is the first time she and I have lived in the same country at the same time, with us both in England. However, she is preparing to leave on another expat adventure next month, and I will return to the US in a few months. Expat life is like that. We are ships passing quietly through the night. Sometimes, we have the privilege of disembarking to meet other travelers and partake of those special moments that become richer because of our shared experiences, obstacles and challenges. Thank goodness for the internet, that imaginary spider's web that keeps us tightly spun together, even when we are physically miles apart. Wishing Germaine the happiest of birthdays and greatest of adventures on her family's new assignment. I will miss her. Stampin' Up! stamp sets used: Postage Due, Vintage Labels, Feeling Sentimental. Paper: SU! Well Worn Designer Series Paper, Pool Party, Whisper White, Crumb Cake. The phrase 'better late than never' comes to mind with this BoBunny Mini Edgy Album and coordinating Sophie designer paper pad. I don't even know how many years I've been 'sitting on' about 6 of these paper pads and albums, just waiting to teach them at one of my Craft & Chat gatherings. However, time is ticking for me here in England . . . I won't have that many more 'dates' with my crafty ladies. I wanted to share these 'edgy' albums with them before I darted away to live Colorado. In addition, I thought one of these albums would be fab as a baby shower gift for my hairdresser, Alicia, who is getting ready to go on maternity leave. I've created a little slide presentation so that you can see all the pages to the album, and I've uploaded some of the pages as photographs, too. The paper pad is already pre-cut to the size of the mini edgy album. I don't think I'd have the wherewithal to cut the paper so precisely, so thank goodness the process was done for me! I used specialized Art Institute Glue to adhere the paper to the album. Then I attacked the pages with Stampin' Up distressing tools and sanding block. All the edges were distressed with ink, allowing the ink to absorb into the chipboard of the albums. The paper pad had extra sheets of designer paper so that I could create photo backings and journal tags. I rummaged around for beads, buttons, ribbons, twine, die-cut flowers, and anything else I could find to make the pages interesting and layered. As always with paper crafting, there is no one right way to make the album. Let your creativity soar!